Made of top-quality white ABS these 17 inches by 14 inches, signs feature excellent durability and resiliency. These signs are the perfect eye catching piece to draw customers into your store. CUSTOM PRINTING. Source One offers top quality 17" x 14" signs UV printed onto 3/16 Coroplast. Our Signs will last for years, without ripping. PROFESSIONAL QUALITY. Made of top-quality white ABS these 17" x 14" signs feature excellent durability and resiliency. These signs are the perfect eye catching piece to draw customers into your store. EASY USE. Our signs are light weight and easy to use. 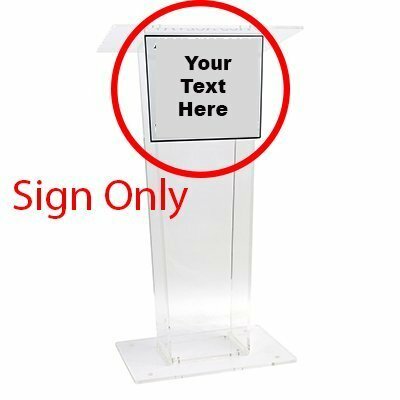 Can simply use velcro tape and add it to the front of any podium to add a professional look to any speech. SOURCE ONE. We offer multiple types of custom UV printed signs as well as sign holders. Buy our products together to ensure a perfect fit, and keep your store looking uniformed and well put together.